Unfortunately, the budget version doesn't come in that great shade of yellow, but the shape is dead on. What do you think of this? Is it something you would wear? Wow, that's dead-on! I would wear it! How cool are you?! I love it. Thats amazing how similar they look! thanks for the tip! K-Mart nailed that look! You could always buy the K-Mart one and dye it. Thank you so much for spotting this. I've been wanting that top from Anthropologie but I couldn't afford it. I will be stopping by K-Mart today! oh my, dead ringer! thanks for the tip! With black pencil pants, pointy flats and red lipstick? Yes I would actually. WEIRD! I totally bought this at Kmart a month or two ago. I love it! I bought a fitted suit jacket of the same brand there too to wear over it in my chilly office. I love it. So versatile. WOW! Almost the exact same. Nice find! Great find girl, that's awesome! You are amazing! How do you do it? ARE YOU KIDDING ME! K-mart? WOW. I'd totally wear it! 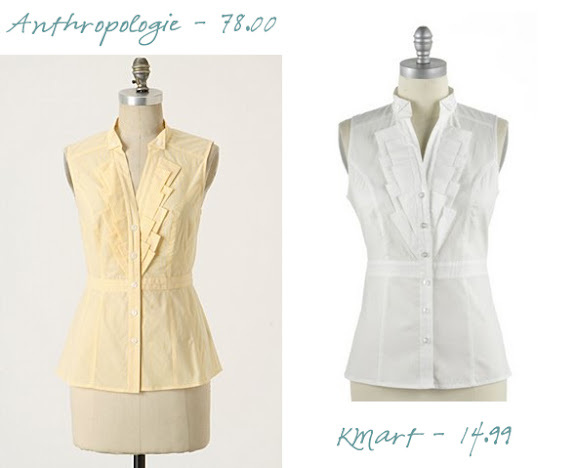 and you could easily throw some RIT dye on the K*mart version for a nearly exact copy of the Anthro blouse. Good find!